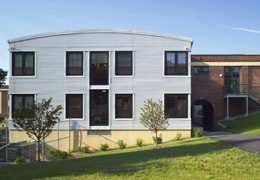 Grasslands Shelter for Volunteers of America, Valhalla, New York (renovation, adaptive reuse) Homeless Westchester adults find shelter and supportive programs in this 60,000 square foot building, a gut-renovation with addition of a former County storage facility in the Westchester's Grasslands campus. Programs previously dispersed throughout the County are collected here, affording a full range of services for residents. Besides sleeping quarters, the facility includes a commercial kitchen-for meal preparation and food service job training-dining room, classrooms, activity room, a large multipurpose room, and outdoor recreation areas. 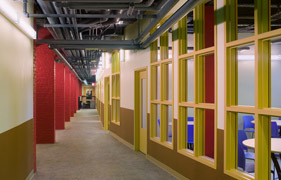 On a tight budget, STA sought to exploit the building's bold column structure while modulating hall widths, introducing color, interior windows and playful lighting to humanize the spaces.